NiceGuard is an extremely durable poly-resin coating that we can apply to badges. This adds a level of durability and class that non-coated badges simply can't match. NiceGuard is self-healing, meaning it does not dent, it simply rebounds. NiceGuard is guaranteed not to cloud or yellow. We recommend NiceGuard to anyone that works in the sun, around a lot of chemicals, has a job that could be rough on a badge, or those who might get scratches on their badge from purses or pockets. 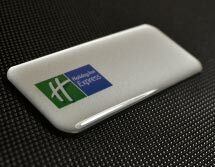 Even if you may not be too rough on your badge, NiceGuard is also recommended for its high quality and visual appeal. Will NiceGuard Fog or Fade Over Time? NiceGuard is guaranteed to retain its crystal clear appearance for many years. Will NiceGuard Scratch or Dent? NiceGuard is resistant to dents, and scratches. NiceGuard is unaffected by most industrial chemicals used for cleaning. Will NiceGuard Melt When Exposed to Extreme Heat? I'm writing to express my amazement over the name badges I received. I am the manager at Dairy Queen and we often order badges from Recognitions Specialties, but on this last order they suggested we purchase their new, more durable badge. When we received the badges we put them through some tests. We dropped, bent, and sent them through the wash and they performed magnificently. It was then we decided to really test their "durability". We took one of the badges and placed it in a fryer at 350 degrees for thirty seconds and removed it. We were stunned to find the badge unscathed. It had become soft and flexible from the heat, but in less than a minute it regained its rigidity and form! I am writing this letter to first of all say thank you for suggesting a great product and secondly as a testimonial for the durability and strength of the new badges.